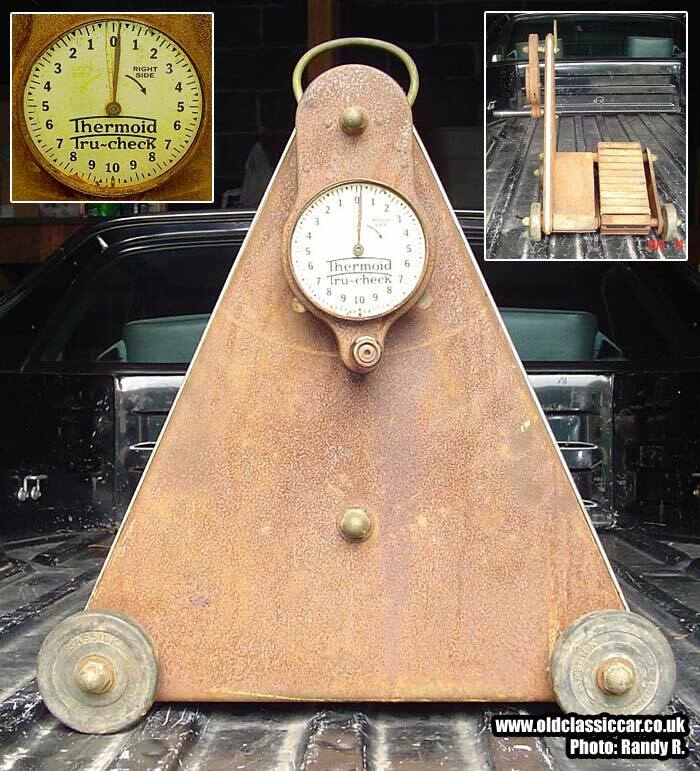 The Thermoid Tru-Check car brake tester from the 1930s. Homepage. This page: An automobile brake testing tool for garages in America from the 1930s. Thermoid "Tru-Check" brake testing machine. A number of car brake testers are covered in this section of the site (for example the drive-on Weaver brake testing machine from the late 1920s). 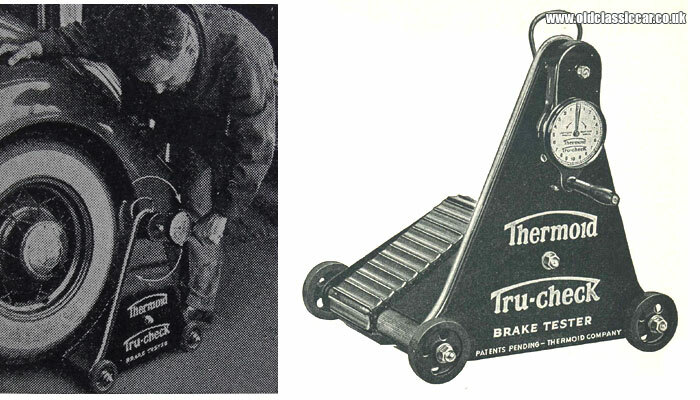 The machine shown below, the Thermoid Tru-Check Brake Tester, was developed and manufactured by Thermoid, of Trenton, New Jersey, USA in the 1930s. Operating the Tru-Check was simplicity itself apparently. The tester was mounted on wheels with rubber tyres, and incorporated a caterpillar track to one side. The car would be jacked up an inch or so, and the tester wheeled up so that the track pressed against the tyre of the corner being tested. Inside the car, an adjustable pedal depressor would be installed between the brake pedal and something solid, locking the brakes. With the Tru-Check in position, the mechanic would rotate the crank handle. The resistance to the turning force being applied by the mechanic would be recorded on the dial, so that comparisons between different corners of the car could be made, and repairs to the braking system identified. "Everybody knows that until Thermoid Tru-Check was perfected and patented, no low-priced brake tester worthy of the name had ever been offered. And the trouble with high-priced brake testers had been their inability to pay their way - particularly in the smaller shops. So shops have had to do their testing by "hand feel" and road tests, despite the recognized need for greater accuracy .... The Tru-Check Brake Tester eliminates all guesswork - enables you to test and balance brakes scientifically. It grips the tires - eliminates slippage. It detects improper adjustments, faulty linings. Small, compact, portable yet sturdily built - and so simple to operate that any mechanic can do an expert brake job with it." An original Tru-Check brake tester turns up in the USA. "I brought the Tru-Check home tonight. I did take the bottom cover off and I see it was painted black under there, so I am going to assume it had white lettering so that's how I'm going to re-do it. Can't wait to get started on it. It will go great with my 1933 Maytag gas engine washing machine I've re-done, and my 1948 Plymouth complete dash that I have hanging above my TV, and the 1927 Ford grille shell with all the orig. Ford tools mounted inside. As I said she is a little rough right now but as you can see it's all here. I took the lens off the gauge because it was so discolored with rust - you couldn't see the face at all (I do have it though and it's all there for a pattern to make a new one). It will be a little while until I get it done but I will keep you updated. I'm trying to figure out what I can use to clean the face up that will not harm the letters or numbers. After that the rest will be easy." "[The seller] has an old auto salvage yard that has cars and trucks from the '20s to the '50s and nothing newer. I go to see him all the time and he always has something to show me. This was in an old panel truck since the early 60's, and he pulled it out to sell at a show this weekend - I saw it and had to have it. I had no idea what it was, nor did he. I have purchased many things from him over the years and he has a basement and old house full of very rare items, and just as many stories to tell as well."